I’ve shared a lot here, but not quite everything. I’ve hinted at some darker times a few years ago, but that story has to unfold in a more complete way than it can here — when the time is right. The short version is that I was on a tightrope over a bottomless pit for months at a time; God led me, walking backwards with His hands on either side of my face, saying, “Just keep your eyes on me. Don’t look down. Don’t stop walking. Just keep your eyes on me.” I’ve never felt closer to Him or further from everyone else. Some people think of the struggle with suicidal thoughts as weakness or immaturity instead of a legitimate impasse where your pain has exceeded your coping resources. In a moment of crisis, you need one thing: a resource (someone you can call, something you can read/watch, something you can do) that will distract you and comfort you for just long enough to deescalate, to get to a point where you are able to put one foot in front of the other on your tightrope again. The resource doesn’t have to solve any problems. It just has to carry you to the point where you are able to wait for time to change your circumstances, like it always, always does. So right now, I want to provide a list of things that make me feel like living. I’m not a medical professional and I can’t know what’s best for you, but I hope it will help you pass those crucial moments to read through this list. If one doesn’t apply to you, don’t let it take you down a sad road — just move on to the next one. And please add to the list in the comments below. What are things you wouldn’t want to miss out on? Things that sustain you in the darkest times? Every one of these things should be hopeful, positive, and affirming. Let’s get started! 1. I want to live because my sweet rescue dog deserves a full life with me! She loves me and we make each other happy. I want her to be able to excitedly greet me every day. 2. I want to live because in the summer, I eat out on my balcony and the breeze feels so good. My summer music playlist makes me feel relaxed. 3. I want to live because I know my life means a lot to my family, even if we’re not perfect. 4. I want to live because I love to sit with a vanilla latte at a cozy coffee shop. 6. I want to live because I see that other people have gotten through hard times and that helps me believe that I can, too. 7. I want to live because after the hardest times I ever went through, I had the best day of my life. I didn’t think I’d live through my hard times, much less feel happy again, much less feel incredibly happy. But I did, I did, I did! It’s not perfect and there will be valleys in the future, too, but I want to live for the peaks yet to come. It’s possible the happiest moment of your life hasn’t happened yet! 8. I want to live because it feels so nice to go swimming, take a hot shower, and eat a healthy lunch. 9. I want to live because I know if I live, I’m proving to my students who struggle with mental illness that life is worth living, that happiness is in their future, and that it’s valuable to fight a good fight for yourself. It’s so important to me that I help them learn resilience. 10. I want to live because food is so enjoyable. I remember driving to McAlister’s one night during my hardest times and eating a giant grilled chicken salad. Even though things were hard, I was happy to sit quietly in that booth and taste each bite. 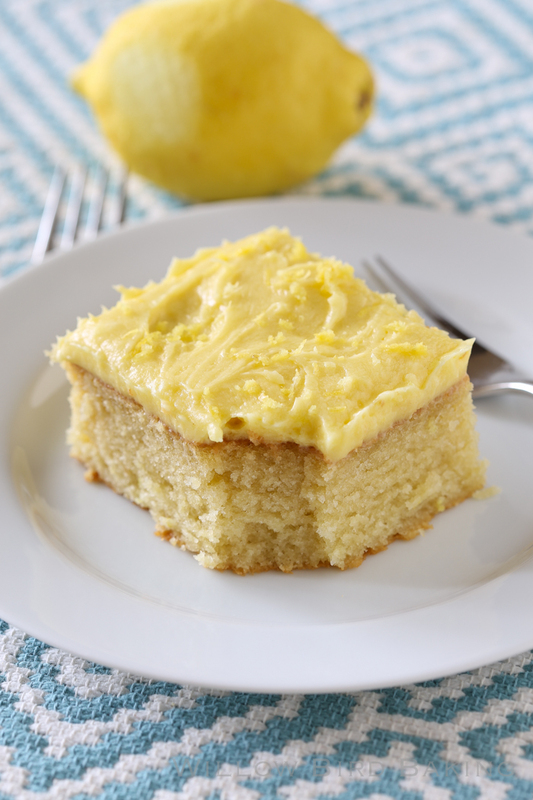 When I create a moist, amazing lemon cake like this one, I appreciate so much that I’m alive and able to taste it. If you’re struggling with mental illness, please remember that I’m not a qualified professional. It changed my life completely when I found one. Get through these next few minutes, but as soon as you can, please look for someone in your area (dialectical behavior therapy helped me tremendously) and make the commitment to fight for yourself. If you feel you don’t have the strength, stop thinking about the destination (100% better can feel so far away) and start thinking about just the next step. One foot in front of the other across the tightrope. What are your reasons to live? Add them below and share this post with the people you love. Let’s build a database of reasons so large that anyone can find one — one is all it takes — that gets them through the next few minutes. You're gonna FLIP. You might want to double this recipe and make it in a 9 x 13-inch pan (if you do, check for doneness early and often) because it's incredible. You won't believe something this good can be this quick and easy. Make the cake: Preheat the oven to 375 degrees and grease an 8-inch square baking pan (I use Wilton's Cake Release to grease my whole pan and then place a sheet of greased parchment in the bottom of the pan). In a medium saucepan over medium heat, bring the butter and water to a boil. In the meantime, in a separate large bowl, whisk together the cake flour and sugar before adding the egg, sour cream, almond extract, vanilla extract, baking soda, and salt. Mix to combine. While mixing, slowly pour in the boiling butter and water mixture. Mix to combine completely. Your batter will be very runny. Pour the batter into the prepared baking pan. Bake at 375 degrees for 17-22 minutes or until a toothpick inserted in several places comes out with a few moist crumbs. Cool completely (I stick mine in the fridge and it was cool in about an hour). While the cake bakes, start the frosting. Heat the milk, flour, and granulated sugar together over medium heat, whisking constantly. Once it starts to boil, continue whisking and heating it for around 7 minutes or until it's very thick, like cake batter consistency. Remove the mixture from the heat and whisk in the lemon extract. Remove the mixture to a shallow pan and let the mixture cool completely (Again, I stick mine in the fridge for an hour). When the cake and frosting mixture are both completely cool, finish the frosting. Beat the butter in the bowl of a stand mixer until soft and fluffy. Add the completely cooled milk/flour mixture and beat on high (mixing in a few drops of food coloring if desired) until you have fluffy frosting the consistency of stiff whipped cream (this takes a few minutes — don’t worry!) 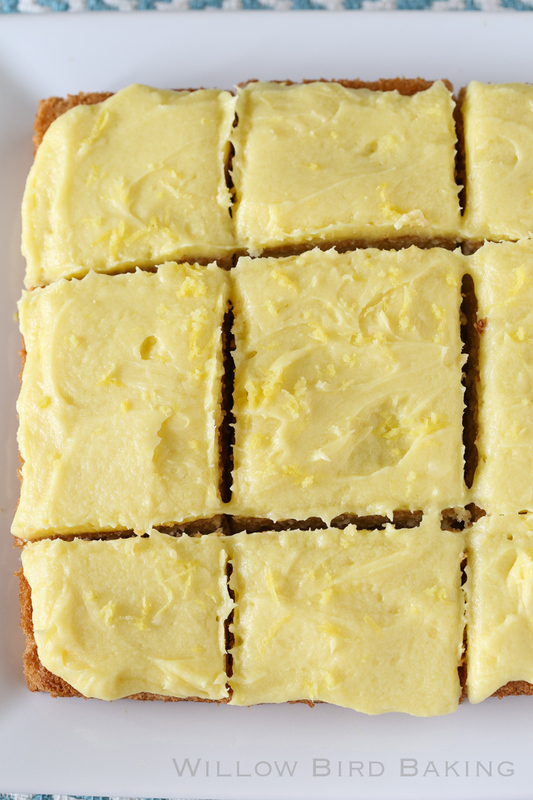 Turn the cake out onto a platter and spread the frosting over the top. Top with lemon zest and serve! « Lemon Shortbread Crumble Bars: The ULTIMATE Lemon Lover’s Dessert! That delicious blissfully exhausted feeling you have after spending an entire day at the beach. That perfect moment when the next song on the radio exactly matches your mood. I want to know how I will look with a short cut grandma perm. seriously, I want to know. Sharing my story with other people and really connecting. I want my victories and suffering to be of some value to someone. Maybe I can help. I still haven’t danced like no one was watching yet. I don’t know, my Grandmother looked darling and sophistocated with it. She was also a woman who was able to rock the old Beehive hair do with a lot of grace. I feel I should also add that I have suffered from anxiety, depression and suicidal thoughts. I have had therapy, and medication and the end result is that I am most of the time far better able to handle my feelings. I now am much more likely to turn to a friend or my husband when i start to feel overwhelmed. Sometimes just giving voice to my feelings helps me get perspective on them. It’s also a bonus help when what I say is actually how someone else feels/has felt. It is strangely soothing to know that you are not the only one feeling this way. It must be survivable if others feel it too. I also wanted to point out the reason that I didn’t mention family in my list, though i do in fact consider them a primary reason for me. This is not intended as a reproach, just a sensitivity reminder for those not suffering with these issues. I didn’t mention family because some people don’t have a family/can’t have children (me)/ etc, and this is part of what they are fixated on, part of their list NOT to live. Not everyone has these same issues. We are all different, and some people need the reminder that family is a reason to live. Don’t change your reasons to live to suit the world, but do remember that someone you are talking to and trying to encourage may feel differently about some things.Always best to get them to talk to you before you give encouragement. Oh, Julie. You are so strong! Honestly, I’m shocked you have dealt or are dealing with this. I don’t know the right things to say in these situations. I’m sorry. Thanks girl 🙂 It’s been a few years now that I’ve been in the “all-clear,” but as I mentioned, more valleys might always be in your future. So I love arming myself and helping undergird others as much as I can. Julie, thanks for the recipe and for being strong and sharing your struggles. In times like those, we so often feel alone… I know as I’ve been there myself. But everyone – and I mean everyone – goes thru dark pits of life, and the more we share with each other, the better we can deal with what’s going on, push thru, and move forward. 2. family. husband. mom. dad. grandmas. siblings. cousins. 3. friends who are even closer than family. my besties. my girls! 4. surf… I have not surfed all the waves I want to surf in this life. And I just must. It’s too much fun to miss out on! 5. sunshine. laying on the dock and listening to the breeze, the birds. 6. yoga. I love it. It helps me become more mindful, to breath better, and to be still and let things go, even if just for a bit. sort of like surfing! I can’t say I have been through something you are going through, but I have been dealing with a shocking break up/divorce in the past 4 months or so. And as crazy as it sounds, one thing that has helped me is watching old episodes of The Office. I had never watched it before and now I’m on my second time through all the seasons. I inevitably laugh out loud at every single episode, and it has helped to distract me. 1. to find the beauty in nature and all things living that we take for granted everyday, like the leaf on a tree, a flower or the clouds (how awesome all these things are)! 2. for me, food is huge- like this cake! how can I not want to make and try this cake? Now, to see about that cake! I love how you’ve made yourself supportive in someone else’s life such that you feel a keen sense of loving responsibility to them. How precious. Thank you, Christina! Depression is caused by many things but I never suspected what I ate had such a profound impact on my mental state. I sincerely hope you are able to discover the root cause of your depression. Good luck and thank you for the beautiful blog. I love it even though I cannot eat much of your recipes! Thanks for sharing, Melinda! I hope you get to try some of the savory recipes now and then 🙂 Those Mediterranean Sweet Potatoes are calling your name! 1. My daughter. I’ve waited so long to become a mother, and now that I am, I realize more and more each day how influential I can be. I want to stay alive to be a positive role model for her. 2. My journey. Despite being nearly 35 years old, I don’t think I’ve quite found what I want to be when I grow up. I want to stay alive to give myself enough time to find It. Aw, thanks Michelle! I would love that!! Aw, thanks Michelle! I would love that!! And I want to meet baby Caroline too! I was talking to my therapist recently, that I think for the first time in a very long time I feel happy and not afraid, that I’m actually enjoying living instead of enduring. 1. I stay alive because when I was a kid I would have given anything to know an older queer person who survived and was living a good life. Being able to talk to younger people in my community and say “you can be a whole person, you can live a life with happiness, you don’t have to give up” means a lot to me. 2. The sky. I love the sky, the big endless Texas sky in all its moods and colors. Every day it is beautiful. 3. I have not yet eaten every taco that exists. I can’t stop living until I have eaten all the tacos. 4. There are so many books I haven’t read yet. And there’s stories I haven’t finished writing. Wow!I have suffered from depression for almost 10 years, it started as post-natal but has continued from that. With the way family have tragically passed away, (my step brother aged 17 in a car accident). There are other things too but I don’t want to go into them. Just yesterday I had a terrible day and didn’t want to continue by reading your 10 reasons to live has made me think of my reasons. 1. I want to live to see my children grow into whatever they choose to be. 3. I want to meet my future son and daughter in law, and hopefully grand children. 5. I want to live to keep having cuddles with my furry family, they always make me feel better. I can’t say I’ve ever felt the thoughts you’ve spoken of but I have had some pretty low times in my life (anxiety, depression) and I’ve just wanted to sleep for days so I didn’t feel like I did. That being said, you are totally right that having someone to talk to helps A LOT! I just love your reasons to live and I have a few to add to it – first, this cake. Because this cake looks so good and is totally worth living for. 🙂 Also, travel. There is so many wonderful places to explore and experience. My dog. My family and my friends. Stay strong Julie and keep doing what you are the best at and that is……bringing all of us such wonderful recipes and enjoying seeing how you spend your free time with your furry friend. Those furry buddies are the best for they love you when you need it the most. You are wise beyond your years and this is what got you through these hard times. I am a very strong proponent for more mental help in our country. There are way too many people who suffer because they need these services. God Bless you sweetie and remember there is always HOPE. Great post! Inspiring writing not to mention bright, zesty, happy photos! The sunshiny yellow pictures are the perfect juxtaposition for this serious subject…thanks for sharing! Thanks for being candid and for being a good example for your students and a watching world. I have been in a very dark place. I could not even smile for more than a year. There was no joy in my life, only pain. For most of that period, I prayed the Lord would just get me through the next five minutes, then the next five. I felt like I had to claw my way out of that pit or die in it. So I clawed. It took a long while to feel like myself again…years in fact. One of the ways that helped me then, and later after my husband passed away…and even now when things aren’t going so well…is to focus my attention on someone else. I send flowers, write cards, send an unexpected gift, bake treats, prepare meals, etc….to make a bright spot in someone else’s life (and take my focus off of myself). I might add that I am allergic to aspirin and ibuprofen, so a readily available exit has been a temptation which I have avoided. I think that fact gives weight to my reasons for not using that exit strategy. 1) That God might use me in other people’s lives even if I am unaware to what extent.To that end, I pray I walk worthily. 2) That I might be an example (positive or negative) to those that know me, that choices in their lives are made easier. 3) That I might be available to comfort and hug those whom I love, and laugh with those that love me. 4) That I might continue to experience more new things, see new sights, witness life unfolding and enjoy new adventures. 5) That I might be around to empathize with others, known or unknown, who are going through difficult times, as the many various trials in my life would be put to benefit. 6) That I might be able to observe my children and their children as they grow older, and to offer guidance and/or assistance…and always love. 7) That I can make a difference in my tiny corner of the world just by smiling at a stranger…or showing kindness and generosity on a daily basis… to those around me. 8) That those that love me might not have to experience the pain of losing me. No matter what pain I’m experiencing,I don’t want to cause others undue pain. 9) That I might provide my heart for service as long as it is of value and someone loves me somewhere. 10) That I might show and express my love daily, for many more days. Thanks, Julie….and the cake looks great! I love your honesty. Thank you for another beautiful recipe too! I am sitting here with tears in my eyes. I think you are amazing! Beautiful post with beautiful words! There are tough moments in life, but you perfectly captured God’s Love for you in that first paragraph! In addition to Him, the gifts of good friends, loved ones, counselors, and therapists are there for people to turn to for help. You are a blessing for so many for sharing your journey! God bless you. Cooking. I got through my suicidal depression ~2-3 years ago with an almost obsessive daily attention to turning ingredients into food. And reading food blogs, including this one! Thank you for posting this on the feministing thread — I don’t follow food blogs as closely as I once did, and I had missed this post! Thank you for sharing your story, and your list. And, of course, your cake. This is a great post. Thank you. You’ve added to my “why I WANT to stay alive list” as opposed to my “Why I HAVE to stay alive” list. 1) My children are teetering on the brink of adulthood, and I can’t wait to see the amazing people they’re going to become. 2) Squeeing fangirl moments. I write books. I go to science fiction conventions. I have sat on panels with many amazing people and met more than my share of media personalities. I have squeed over everyone from Terry Prachett to Esther Friesner to Nicholas Brendan. And I have been on the getting end of “Oh my goodness, you’re Angelia Sparrow!” Both are amazing. 3) There are books yet to write. 4) There are oodles of crafts and recipes on my pinterest board to try out. Those are the lessons I have learned from walking in the dark. Are these beat the day-of, or can they be made the night before? Mary, you can make it the night before. Just refrigerate it overnight. Before serving, definitely let it sit out for 30 minutes or so for the frosting to soften. 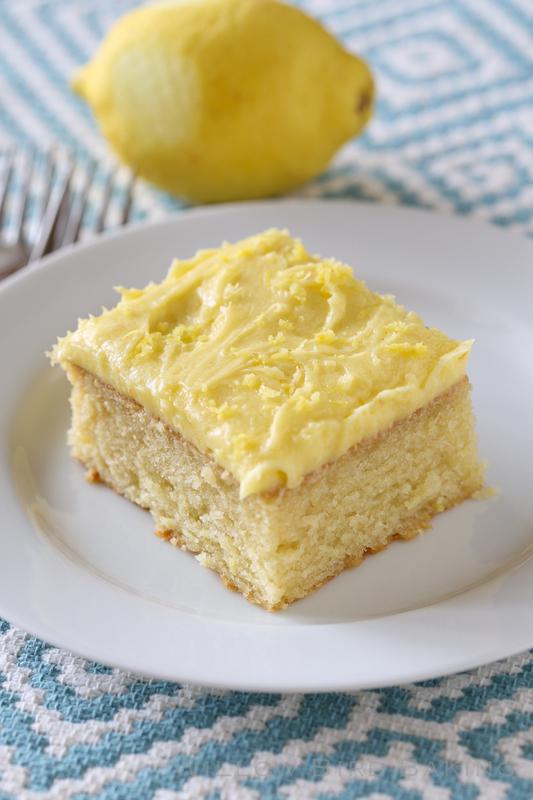 This is definitely, to date, my favorite yellow cake recipe that I have tried. And trust; I’ve tried a bunch! It’s super moist and cakey. I love the sour cream instead of milk- it adds a nice consistency! I’m so very glad to hear that, Nyna! I love it too! !